work-structure Rows 1-2 present the work operating with ‘stepping and stacking’ components, gliding between differently scaled step-angled surfaces and shift between ‘hollowing out’ darkness and ‘circumscribing’ light configurations. Rhythmic agencies make use of ups and downs, bright and dark, ascending and declining forces, including model-iteration as well ascamera-moves. Vector-lines or lines-of-intent configure the drawing-field as shifting between rising and lowering horizontal demarcations. Row 1, mediated body-movement (edited excerpts from videos), interacts rhythmically with tectonic lines of intent. The line-geometry forms part of surface-tectonic,as well as the masking of contextual material (edited excerpts from videos). 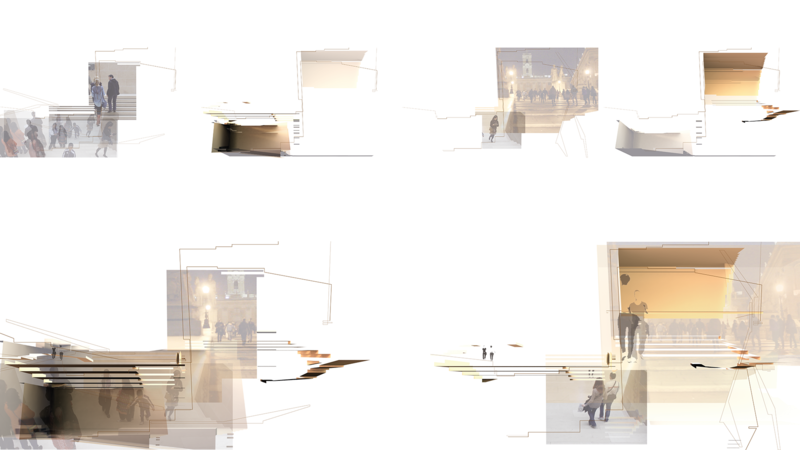 Row 2, combined work-components and layers (excerpts from video-sketches).